Copyright 1929. Printed pattern pieces. Pattern is partially cut and complete. Dress with below normal waistline has peplum and bertha collar. Slit front opening. Self fabric belt. Childs' Size 6; Breast 24. Gray paper envelope with pasted color illustration on front. Envelope has aging and some soiling but is complete and intact. Skirt front pattern piece has been adjusted in the way of a sewn-on, rectangular tab which can easily be removed. Additionally, a scalloped version of the collar which someone created on newspaper, is included. 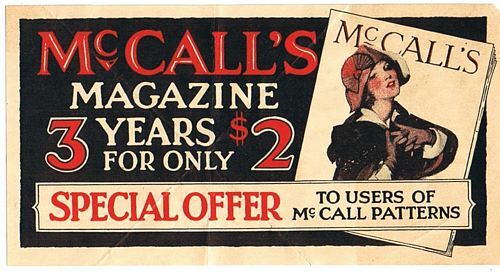 A Vintage Advertising Coupon for McCall's Magazine. 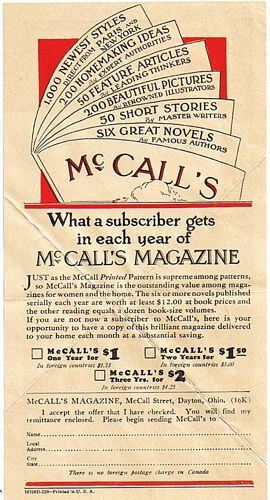 See additional photo below which shows the front and back of the coupon.